While every effort has been made to ensure the display of accurate data, the vehicle listings within this website may not reflect all accurate vehicle items. All inventory listed is subject to prior sale. The vehicle photo displayed may be an example only, especially if the photo in question is not clearly photographed against the backdrop of the dealership. Stock photography is used for vehicles that are pending delivery or in service. Pricing throughout the website does not include any options that may have been installed at the dealership. There may be other dealer preparation or service fees not shown within pricing documents obtained from the website, which represents costs and profit to dealer for items such as cleaning, inspecting, adjusting vehicles, and preparing documents related to the sale. This notice applies to all information collected or submitted on rustyeckford.com and its hosted pages. Please visit or otherwise contact the dealer for details. If you prefer that we not disclose nonpublic personal information about you to nonaffiliated third parties, you may elect to opt-out of these disclosures (other than disclosures permitted by law). 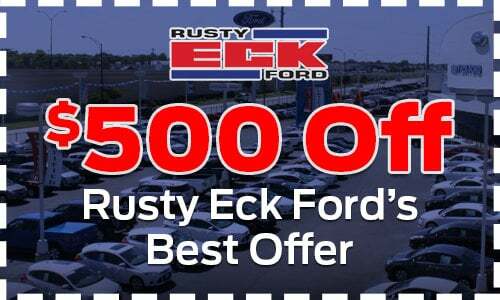 If you wish to exercise your opt-out option, you may do so by contacting Rusty Eck Ford via the contact form.